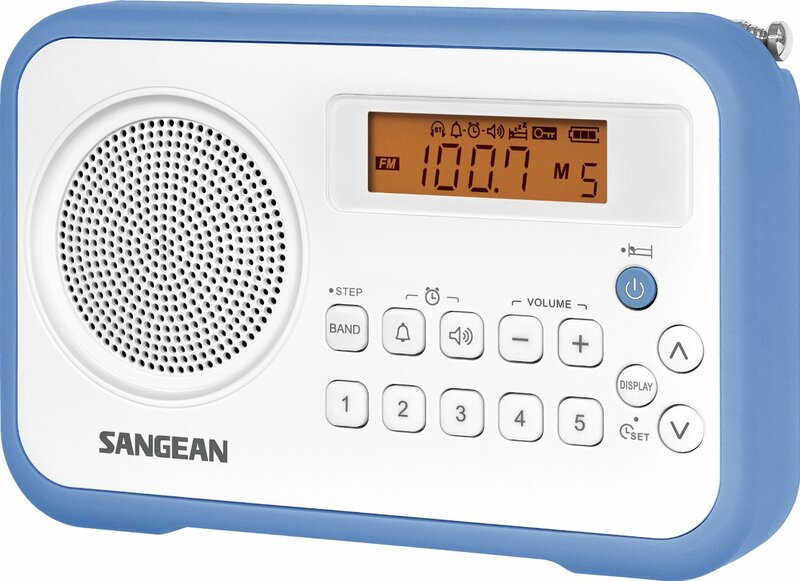 The Sangean PR-D18 radio is a straight-forward AM/FM portable radio. It lists for $69.95 but is easily available for considerably less…around $47 as of this writing. It dispenses with additional bands or MP3 capabilities in favor of the best performance possible for the price along with operating simplicity and ruggedness and has succeeded on all counts. This radio surprised me with its heft and solid feel. It’s a really cute little radio, available in several two-tone color combinations; a gray face with black surround or a white face surrounded by gray, blue or red. Sangean calls these rubber trim pieces protective bumpers which are designed to resist damage due to minor bumps and scrapes. 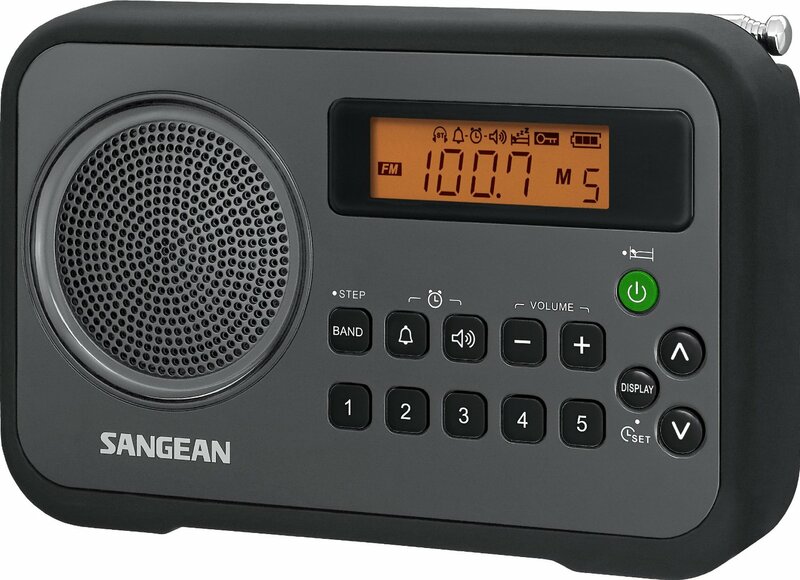 Sangean’s website claims the PR-D18 has “excellent sensitivity and selectivity and will surprise you with its ability to pull in those distant stations.” How could I resist checking one out? The PR-D18 (US version) tunes FM: 88-108 MHz in 50 or 100 KHz steps and AM: 522 – 1710 KHz in 9 or 10 KHz steps and provides FM Stereo at the earphone jack. It also has a DC input jack for an external adapter providing 6V 400ma. *(See note). It has a 2.25″ 8 Ohm speaker and an amplifier rated at 1 watt output (which is impressive if true). 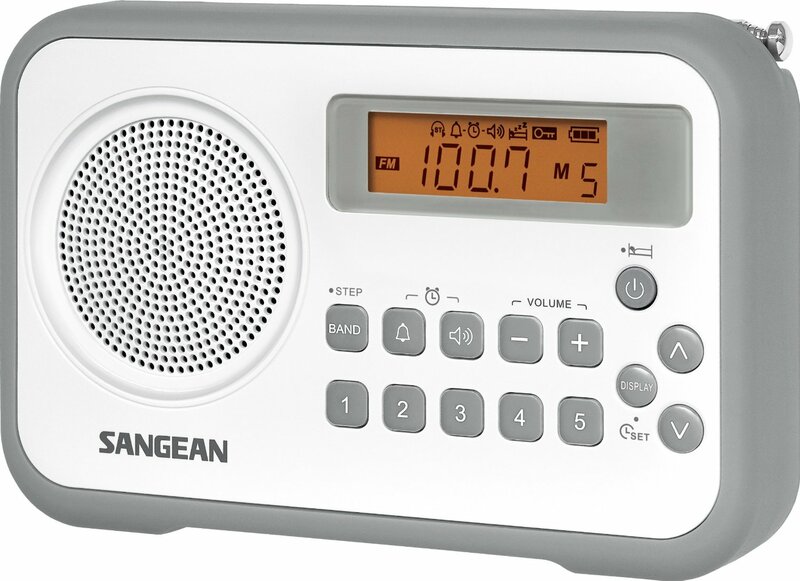 All the usual digital radio features are here including a clock, snooze, 2 alarm clocks with a Humane Wake System which gradually increases the volume , adjustable sleep timer (15, 30, 45, 60, 90, to 120 minutes), 5 AM and 5 FM presets, Auto Seek Tuning, battery level indicator, LCD Display with backlight and a lock switch to prevent inadvertent button presses. It measures 6.5 x 1.4 x 4.2 inches, weighs 12.8 ounces and runs on 4 AA batteries. Performance: I tested the PR-D18 on both AM and FM and found that it offers good AM and excellent FM reception. In fact, the FM is about as good as it gets in a portable radio thanks to DSP technology which has dramatically elevated many recent FM portables to new performance levels at very low cost. In fact the PR-D18 was very close to my best FM portables and for the cost involved that is truly amazing. It easily separated three different stations on one busy frequency and was able to separate adjacent signals as only the best FM radios can. FM lovers will LOVE this radio for its ability to bring in difficult stations…it’s really that good. AM ,while not exceptional like the FM is nonetheless very good for this class of radio and rates a solid ** (Two Stars) in the AM Mega Radio Shootout. Actually, sensitivity and selectivity were very good to excellent for this size and price level but AM occasionally showed some traces of digititus…digital hets caused by inadequate shielding of the DSP chip. Not all frequencies are plagued by these noises so they may or may not bother you. But they are there occasionally and they can be prevented with simple shielding of the DSP chip so hopefully Sangean will address this in future production. (This whole subject of shielding the DSP chip is covered in detail in my Eton Field 500 Review). Still, even with those spurious noises, overall AM reception is very good by portable standards and the combination of good reception and sound make the PR-D18 more pleasant to listen to than most similarly priced radios which sound thin and squawky by comparison. Sound quality is loud and clean and for this size radio is satisfying. While more ambitions radios will offer more treble clarity and bass punch I would describe its sound as pretty good and I had no trouble enjoying it during several extended listening sessions. Overall the PR-D18 offers very good AM reception, superb FM reception and pleasing audio. It should run for a long time on its 4 AA cells, it is small, relatively inexpensive and feels surprisingly solid and well-made. Recommended! *There is no AC power supply provided with the PR-D18…you must provide your own if you need one. It must be rated at 6 volts and 400 mA. While most users will use this radio a portable on battery power, if you intend to use it as a desktop radio where it runs all day, an AC power supply will be the way to go. If you plan to listen to AM while running on the power supply be sure to get one of the non-switching variety…they are becoming harder to find. While switching power supplies are fine for FM use or charging batteries in radios so equipped ( the PR-D18 does NOT charge batteries internally), you cannot listen to AM while using a switching power supply because the noise it generates will obliterate all but the strongest of local AM signals. Many typical modern power supply/chargers are of the switching type and can be identified by their light weight…transformer-based supplies are heavier. I found one suitable model at Universal Radio – there are undoubtedly others.